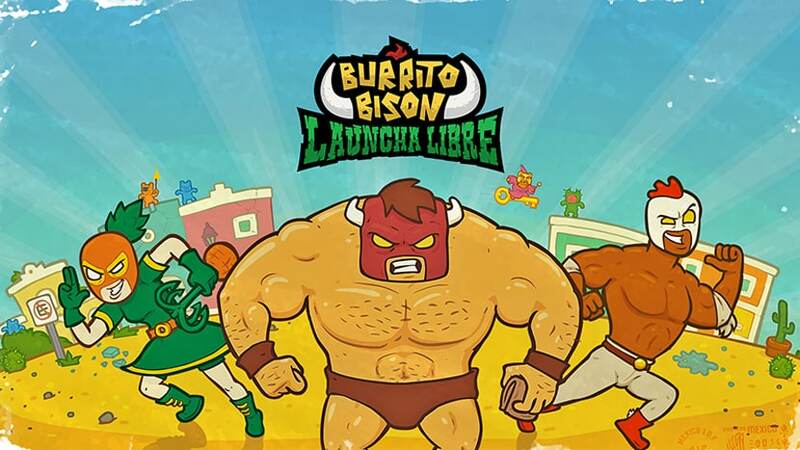 Developed by Kongregate, Burrito Bison: Launcha Libre is an arcade game that requires you to team up with friends like El Pollo & Pineapple Spank and bounce, fly and soar in the skies trying to neutralize the invasion of gummies. It also requires you to wrestle your opponents and catch an evil chef who stole your cookbook. The game works with Android and iOS devices, but it can also be made available on a PC with the help of an Android emulator. Some of your greatest enemies like Gummies, Teddy Flare, Air Gummies and Rocket Gummies operate from the skies, so you will be able to easily reach them if you stay airborne most of the time. You can make use of Rocket Slams which increase your stay in the skies. In order to avoid attacks from your enemies while in the skies, you need to use power-ups and upgrade your game frequently. Momentum is key in Burrito Bison: Launcha Libre, and you can maintain it by getting rid of more Gummies. Speed will decrease when bouncing off the ground and catching the gummies, but you can recharge it by executing Rocket Slams. Your bouncing height will also be maintained when you execute these elements. When in the ring, you can know the best time to hit your opponent by just looking at him. Wait until when he is in a vulnerable state to give him a critical hit which will definitely cause more damage to him. When wrestling, you will find that most of your opponents are fairly easy to defeat and you don’t need great strategies to knock them out. When facing Harry Bow-Tie in the ring, preserve your power to sneak him up when he’s speaking on a megaphone. Concerning Benards, the best time to hit him is when pointing and laughing at you. When fighting Beaster Bunny, you can hit him when he pauses to celebrate, and if doesn’t pause, you can use the Taco Paparazzi power-up to put him in a vulnerable state. When you upgrade, you get purple stars which come with more upgrade opportunities. Each upgrade provides you with one purple star, and you can aim for 20 upgrades which give you 20 purple stars. You can redeem 20 purple stars for a free 3-hour piñata which provides you with progressively better rewards. 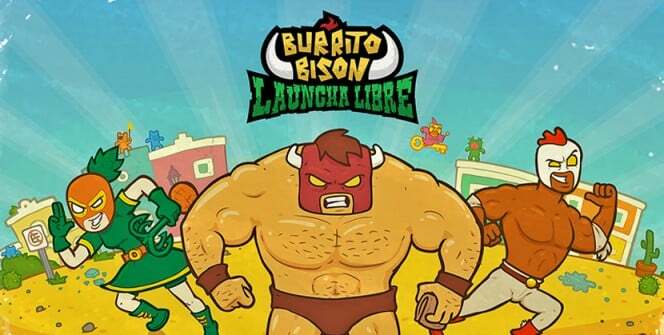 In Burrito Bison: Launcha Libre, video ads last for 30 seconds and you can watch them to open piñatas and enjoy more rewards. 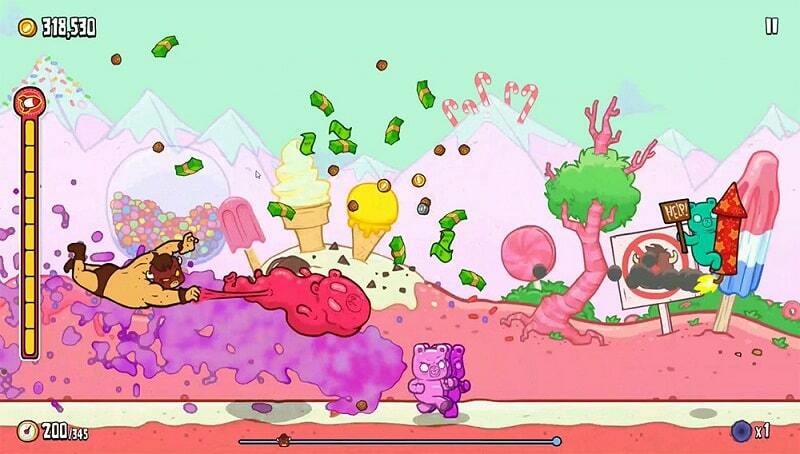 Some of the rewards include coins and power-ups. Watch as many video ads as possible to access the 3-hour piñata which comes with an incredible number of rewards. This game is enjoyed better when being played on a large screen like that of laptop or desktop. Some tasks like wrestling and flying in the skies can only be controlled better by computer controls. In order to install the arcade game on your PC, you need first to install an Android emulator which will allow you access the game app. Sometimes when playing Burrito Bison: Launcha Libre, bluestacks ask you fee to pay but gives you option to download some apps. Every time it asks you just select “Install apps” and continue using it free. I hope you enjoyed this article, please rate and share. If you have problems running Burrito Bison: Launcha Libre on desktop or any other issues, leave a comment below.